As a true fan Helaine viscerally understands no lead is insurmountable. As a Philadelphian she anticipates the worst. And then came this season. The Eagles did nearly everything right. We’re not used to this. Early on they won against the Giants on an improbable 61 yard field goal kicked by a sub who’d never played as a pro before. Their quarterback, Carson Wentz, became a potential league MVP. Last year’s disappointment, Nelson Agholor, became this year’s find. They won consistently. I remember my first Philadelphia Eagles game. My friend Marlene invited me. Her dad, Frank, had a handful of season tickets. Back then, in 1976, a season cost less than a single game today! It was fall, but it felt like summer with a bright blue sky. 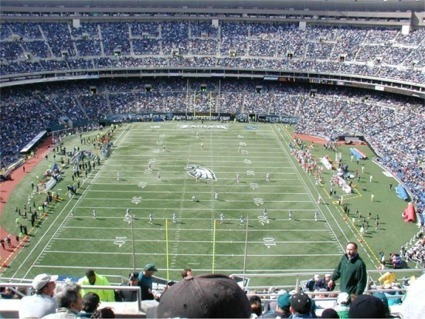 The seats were in Section 614 at Veterans Stadium, high on the shady side near the 30 yard line. We walked out of the concourse and into the stands as a field sized American flag was being unfurled. Ten seconds in and I was hooked on the experience. I ended up buying a pair of tickets from Frank for the remainder of that season and a few afterwards until I left Philly. My first year the Eagles went 4-10 with me sitting in the stands in December, freezing. I always still stayed until the final gun. I was a season ticket holder first, then a fan. It was the experience that got me hooked. Caring about the team came second. And then I met and married Helaine. Her father was a rabid sportsfan. Only child Helaine had little choice. It was she who came into our relationship with a subscription to Sports Illustrated! She’s the most knowledgeable sports fan I know. Nearly every Sunday for the last 35 years she and I have watched the Eagles… maybe anguished with the Eagles is a better way to put it. As a true fan Helaine viscerally understands no lead is insurmountable. As a Philadelphian she anticipates the worst. And then came this season. The Eagles did nearly everything right. We’re not used to this. Early on they won against the Giants on an improbable 61 yard field goal kicked by a sub who’d never played as a pro before. Their quarterback, Carson Wentz, became a potential league MVP. Last year’s disappointment, Nelson Agholor, became this year’s find. They won consistently. And then, in a most Philadelphia way, Carson Wentz went down. The star was gone for the season. Hope was lost. Except it wasn’t. The new QB, Nick Foles, started rough but finished strong. The Eagles totally dominated Minnesota in the NFC Championship game. And they’re doing it without real stars. It’s a team of role players with a very smart coach. Stef is coming by with some friends. Helaine has cooked/baked enough for a small army. We are hoping for a win or at least they don’t embarrass themselves. Sadly, I’ll be working so won’t be able to watch any of the game. This is probably for the best, at least as far as my blood pressure is concerned. Good luck Geoff and Helaine! I’m not for either team! I am not a football fan. Probably shouldn’t say that but such is life! I’m rooting for the Eagles. I love an underdog. Go Eagles! Enjoy the game, Geoff! And, pace yourself with all the yummies! A great win, even tho I’m a Patriot’s fan. I’m so happy for Nick Voles. Well !!! Congratulations Eagles! I’m sorry for the Pats, but it was somebody else’s turn to win. I’m thinking you & your family had a great Super Bowl Sunday! Take care. Congrats to the Eagles and their loyal, if rather crude, fans. I hope they win again – in another 58 years! From a lifelong Patriots fan. Wow, these grapes are sour! Nobody was embarrassed except the Pats. good on them. Well, Geoff, you, your family and your team were certainly not embarrassed. Good for you all!